On April 13th, the United States, in coordination with the UK and France, launched a targeted strike against Syria in response to a chemical weapon attack in Douma which killed more than 40 people. This strike destroyed a chemical weapons facility but is unlikely to do long-term damage to the regime’s military capabilities. Trump’s strike on Syria is not surprising. Such a strike was conducted last year, almost to the day, following the gas attack in Khan Shaykun, which killed at least 58 civilians. Although neither strike has done serious damage to the regime, Trump has maintained that they act as a deterrent for future strikes. This is a dubious proposition as the strike in 2017 failed to prevent a gas attack this year. In an interview with Vox, Jennifer Cafarella, a Syria expert at the Institute for the Study of War, called Assad’s strategy a “siege, starve, and surrender” campaign. As part of that, the town of Douma, occupied by the rebellion, was surrounded by Assad forces. For months, Assad had attempted to drive the rebels out of the town with little success. 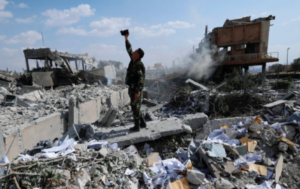 After months of bombardment from artillery and air power, the town had turned into a sort of “rubble fortress.” Following Assad’s chemical weapons attack, however, the rebels were forced to surrender to the regime and the town was taken. Assad’s chemical weapons have a checkered history. Beginning in the 1980’s, Syria, with the help of Egypt and the Soviet Union, set about constructing the third largest stockpile of chemical weapons on the planet, following the United States and Russia. French intelligence from September of 2013 claimed stockpiles included Yperite, VX, and “several hundred tons” of sarin. At the time, Syria was one of a handful of states which had not signed the Chemical Weapons Convention, the CWC. Obama announced his infamous “red line” in Syria in 2012, where he promised to intervene in the conflict for humanitarian reasons if Assad began “moving or utilizing” chemical weapons. As the conflict grew more dire for Assad, the regime calculated that the use of chemical weapons was necessary in order to prevent its own defeat in the war. In the fall of 2013, rebel forces pushed into the capital, Damascus, and commenced a street-by-street battle for the city. Two blocks from the Old City, the regime stopped the rebel advance and began to rebuke them from the city. To hasten the process, Assad unleashed a barrage of five separate chemical attacks between the 21st and 25th of August which killed at least 1,000 to 1,300 people. This attacks were crucial to his success in defending Damascus, and ultimately allowed the regime to push the rebels out of the majority of the capital. Following the catastrophe, Obama looked to enforce his red line. However, public and Congressional support for military intervention was untenable. Instead, Obama sought a diplomatic approach which would destroy the chemical weapons stockpiles. This was apparently successful, but ultimately Assad was revealed to have either successfully hidden chemical weapons or able to produce more. Trump has chosen to enforce Obama’s red line, but has only done so in limited, targeted strikes. Trump’s newest national security advisor, John Bolton, pushed for a larger bombing raid which would do “ruinous” damage to the Assad regime, according to the Wall Street Journal. John Bolton wrote heavily about the geopolitical incentives the United States had in toppling Assad, which some have criticized for not focusing on humanitarianism strongly enough. The lack of a sustained, robust bombing campaign against the regime suggests that Trump has no intention of toppling the Assad regime or committing to a sustained intervention in Syria. These strikes were unsuccessful in acting as a deterrent when they were used last year, and so it is dubious how successful they will be now. Much of Trump’s current strategy in Syria remains mysterious and unclear. With the induction of his new Secretary of State, Mike Pompeo, the administration may choose a new direction in Syria. The direction this administration will choose to take is still unknown. Sophomore Joshua Cropanzano is a staff writer. His email is jcropanz@fandm.edu.